State Rep. and Chester Mayor Thaddeus Kirkland. Pledging to address violence and improve low-achieving schools, State Rep. Thaddeus Kirkland was sworn in Monday as mayor of Chester, one of the region's poorest and most crime-ridden cities. For now, the Democrat said, he will wear two hats - serving as mayor and in the House. Kirkland has rescinded his resignation of his House seat, and said he would remain in the legislature until a budget is passed or until the end of February. He will draw only his state salary, he said. "I am deeply humbled," said the 23-year House veteran, who broke down after taking the oath. "I don't take this lightly." As several photographers jockeyed for position in the crowded council meeting room, Kirkland, wearing a beige suit, placed his right hand on the Bible and took the oath of office. He promised to work with the council to combat the violence that has plagued Delaware County's only city. "We can't police our way out of this," he said. Kirkland, who defeated former Republican Mayor Wendell Butler in the November election and succeeds Republican Mayor John Linder, also announced major changes in the police command structure. He named police veterans Darren Alston, Otis Blair, and James Nolan to positions - Alston as police commissioner, Blair as deputy police commissioner, and Nolan as chief of police. Capt. Marilyn Lee became the city's first female officer to achieve the rank of major. Capt. Steven Gretsky also was promoted to major. After the ceremony, Kirkland said he had given the command staff a year to make improvements in the city's crime rate. "We don't have forever to get things right," he said. A town-hall meeting is in the works to share plans that include community policing, body cameras, and crime reduction, he said. 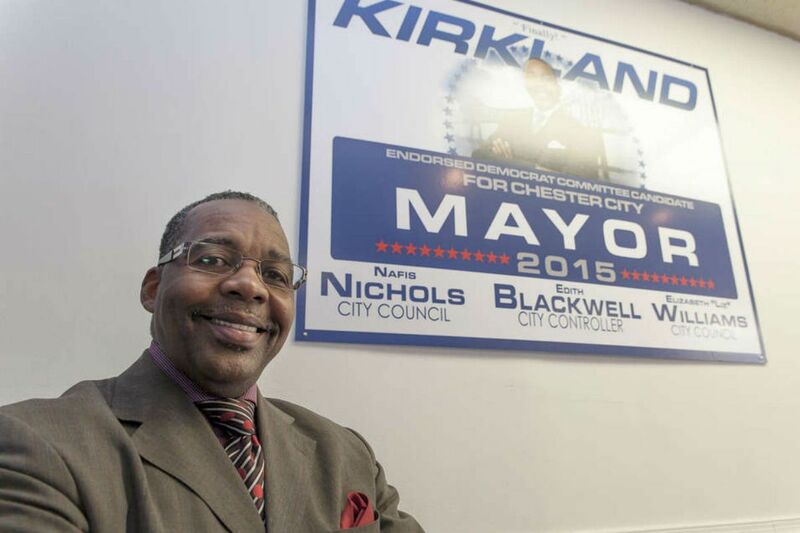 Kirkland, who is the city's 32d mayor, said he plans to work with the schools and the city's businesses to ensure that students receive the education needed to get jobs. "As our schools go, so goes our community," he said. Also sworn in Monday were Edith Blackwell as controller, and Elizabeth Williams and Nafis Nichols to council. Kirkland originally resigned his House seat Dec. 8, but rescinded his resignation New Year's Eve after the state budget again failed to pass, according to his spokesperson, Aignér Cleveland. "He wants to be able to fulfill his obligation to the 159th District," she said. The mayor's job is part-time and pays $41,000 annually.